Just because you have a bad credit history, does not mean you can’t get a competitive rate secured loan. If you’ve recently missed one or more credit repayments or have bad credit due to your credit file being impacted for any other reason, for example by moving home, then we could help. We provide a range of carefully selected loans for people with bad credit. We work with a number of leading lenders who offer loans for people with bad credit so we can find you the best loan rate that you will be accepted for, given your personal circumstances. You may be very surprised at how competitive your interest rate could be compared to many other forms of credit. 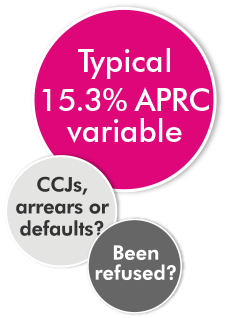 Even if you have CCJs or arrears we could still be able to offer you a loan. How can secured loans help people with bad credit? It’s actually very simple when you look at the bigger picture. Generally, people get a bad credit rating when they miss repayments on existing credit and it can be simply down to people’s monthly bills being a little too high. The answer is to avoid missing repayments in the first instance. It's advisable to look at how you can make your monthly credit repayments more affordable. One option is to consolidate your existing credit outgoings into a secured loan, with one lower monthly repayment. This will help you avoid missing repayments, not incurring credit charges or getting stuck in the credit trap - by paying only the minimum amount on credit and store cards for example. You may even choose to extend the term of the loan to reduce your monthly repayment further. Sometimes, looking at the ‘total amount payable’ can be daunting, but if you look at your mortgage interest statement or add up the interest you pay on credit cards, stores cards and credit charges each year, you could find you make a significant saving overall - especially if you currently make minimum monthly repayments on credit and store cards. Enter the amount you would like to consolidate into our loan calculator for an idea of how much better off you could be! Representative Example: If you borrow £31,000 over 14 years at a rate of 12.758% variable, you will pay 168 instalments of £447.83 per month and a total amount payable of £75,235.44. This includes the net loan, interest of £40,240.44, a broker fee of £3100.00 and a lender fee of £595.00. The overall cost for comparison is 16.4% APRC variable. Turning your bad credit score into a healthy credit score could be a positive move forward, by opening further saving opportunities in the future that may not be available to you with your existing credit status.